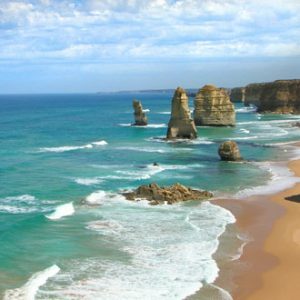 The Great Ocean Road is undoubtedly one of the top-notch tourist destinations in Australia. With many wonderful things to see, touch and taste, this stretch of road is 243 kilometres of breath-taking beauty. With its endless indigenous fauna and flora, a trip along this road will be aesthetically pleasing, educational, and soul-soothing. Some of Australia’s best landmarks and monuments lie about the Great Ocean Road. The Portland Cable Tram, which is a vintage tram from 1886, takes a lazy eight-kilometre around a small part of the area, and is a lovely way to observe the local botanic gardens, car museum, and war memorials. If you are a fan of unusual occurrences in nature, The 12 Apostles are a must-see. Situated along the coastline dubbed the Shipwreck Coast, these gigantic rocky stacks were formed millions of years ago, and get their name from the fact that the ocean gradually eroded the soft-limestone cliffs ranging from Port Campbell, leaving them isolated and cut off from the mainland. Now the last remaining seven stand tall in pride and solace. You can also choose to take a ten-minute helicopter ride for a closer look at these wonders. If you’re looking for more action, however, there are many different stop-off points along the Great Ocean Road, such as Apollo Bay, where you can try your hand at surfing, jet-skiing, and even scuba-diving. The Otway Ranges offer the perfect terrain for adrenalin-junkie sports such as 4X4ing, dirt road biking, and rock climbing. As for accommodation, the possibilities are endless, with your options ranging from luxury bed and breakfasts to camping, and even tree houses. Hear about the Great Open Road food selection? You will find a wide variety of dishes along the road, but the most popular local dishes typically contain seafood, as the coast is famously rich with many different types of shellfish and line fish.